"This result is corroborated by our finding that a model comprising two Asian waves of migration coming through Bering into the Americas"
I've always been doubtful about the research that indicates a single migration into the Americas. In spite of arguments over the overall diversity of American languages it seems that the Na-Dene group is distinct from all the others (and seemingly related to some Eurasian languages), whether the others are all related or not. This distinction is most easily explained as the result of a separate migration. That was what I've been thinking all along. It was obvious to me that early and late Native American populations belonged to two distinct races: the former being Australoid or Caucasoaustraloid, and the latter being Mongoloid. The same two races existed in East Asia during the early Holocene (maybe also during the last a few thousand years of the Pleistocene) side by side with each other (Mongoloids probably making their first appearance anywhere in the world). It is very arbitrary and probably wrong to assume Australoid-looking people as ancestors of Mongoloid-looking ones. Mongoloids surely didn't come out of nowhere, but we currently don't have any evidence of how Mongoloid (or rather proto-Mongoloid) morphology came into being. but we currently don't have any evidence of how Mongoloid (or rather proto-Mongoloid) morphology came into being. 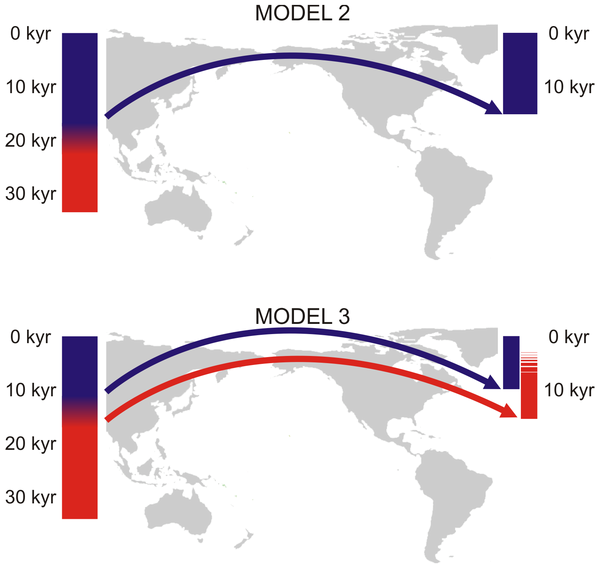 "We conclude that the morphological diversity documented through time in the New World is best accounted for by a model postulating two waves of human expansion into the continent originating in East Asia and entering through Beringia." The morphological diversity documented through time in the New World can also be accounted for by a model postulating the existence of an ancestral population in the Americas much earlier than Clovis that diversified into two attested morphological types - the "Paleo"-Indian and the "recent" Indian. The first one went largely extinct (although survived in Fuegians and Baha Californians), the latter one persevered. The current paper, although again based on a myth of the peopling of the Americas perpetuated by archaeologists (hence the fourth scenario is not even being entertained), actually shows that a very ancient pre-Clovis population in the Americas is a poorly documented but a necessary corollary of several lines of evidence. This is in perfect accordance with linguistics and kinship studies that document high diversity and the high frequency of ancestral types in the Americas. "Mongoloids surely didn't come out of nowhere, but we currently don't have any evidence of how Mongoloid (or rather proto-Mongoloid) morphology came into being." Mongoloids, just like American Indians, have high frequencies of shovel-shaped incisors, which is an ancient hominin dental trait widely attested in Neanderthals (not uncommon in modern African populations). It's likely that some characteristic aspects of Mongoloid morphology (cranial and dental) is a retention from Asian and Eurasian hominins. In light of the fact that African San have epicanthus - another Mongoloid trait not present in Amerindians - is another indication that "Mongoloids" could be older than we think, both in the Old World and the New World.The most recent discovery of Neanderthal "admixture" in modern humans outside of Africa fits with this line of reasoning very well. "In spite of arguments over the overall diversity of American languages it seems that the Na-Dene group is distinct from all the others (and seemingly related to some Eurasian languages), whether the others are all related or not. This distinction is most easily explained as the result of a separate migration." May be a separate migration from North America into Siberia at the end of the Ice Age? The dates of Clovis-type tools are becoming younger as they progress from southern areas of North America into Alaska (Mesa culture). The Ket language that was recently showed to be related to Na-Dene could be a product of this reverse migration to Siberia. If you look at Y-DNA C haplogroup, which is found at high frequencies in Na-Dene, is also found at low frequencies in Inuits, North and Central American Indians. It's also noteworthy that the authors' Fig. 2 connects Upper Cave to Paleoindians (in line with Neves and Pucciarelli's work in the 1990s) but not to recent East Asian or Australasians. Modern Tolai are linked to Paleoindians, Ainu and Australian aborigines. "Our findings are at odds with the majority of molecular evidence on Native American origins..."
This said, there's evidence that Paleoindian DNA belonged to the same set of mtDNA haplogroups as modern Amerindian DNA. This suggests that those Amerindian haplogroups may be older than usually described by the "molecular clock." This would eliminate the disparity between craniological and genetic studies. mtDNA A, B and X haplogroups (macrohaplogroup N) would then correspond to one of the morphological types found in the Americas, while C and D (macrohaplogroup M) would mirror the other morphological type. The same cane be said about Amerindian Y-DNA Q vs. C haplogroups. In this case, the conclusion that can be found in the majority of genetic studies, namely that Amerindians are derived from one single founding population stays true. The only difference is that this population is very old. what is caucasoaustraliod? in the article the only candidate populations for peopling the new world I saw were the East Asians and the Australo-Melanesians. also how would kennewick man fit into all this. Wasn't he white looking (at least he didn't look like one of just two populations). Wouldn't that suggest it would be wrong to think that the Americas were populated by only two homogeneous populations? One could also reach a similar result with a pre-migration Asian population structure result (e.g. several tribes some from one area and others from another area that cooperate). There is population genetic evidence for a split between the East and the West part of the dispersal, with haplotype X, for example, found in the Eastern dispersal but not in the dispersal that moved along the Pacific coast of California and South America. The genetic uniparental marker evidence would suggest one population from Siberia (associated wit haplotype X which is not found in other Southern route populations, and with the Na-Dene language) making up a minority of the total founding population, and a majority coming via China. Since the climate of Beringia and the North American areas would have been more like that of Siberia than China, one could imagine the tribe or tribes that were from Siberia or had members from Siberia leading the confederation of tribal bands to the New World, and being less interested in heading South along the Pacific route to warmer climes. I also wonder, however, how much of the difference in anatomy could be due to changes in diet, rather than genetic. Diet is a major factor in stature in modern Asia, where the Japanese and South Korean young adults of today are much taller than those of the previous generation or the generation before that, despite nearly complete endogamy. I suspect that anatomy changes are limited to stature. Early Native Americans would have undergone multiple major diet changes with Beringia, inland North America pre-mega fauna extinction, inland North America post-mega fauna extinction and the Pacific coast offering very different food supplies. Absolutely. It should be self-evident that there were at least two completely different cultures and populations in Beringia: inland tribes with a predominantly large-game hunting sustenance supplemented by river fishing, and coastal dwellers with largely sea fishing and sea mammal hunting. The former would have had ties to other inland populations from Siberia to China and Mongolia, the latter would be related to coastal people down to Japan. Both had the opportunity to migrate into the Americas at roughly the same time. I also agree that so many cranial features are diet-dependent that all such studies have to be taken with a huge chunk of salt. Finally, it should be clear that (i) AMHs migrating out of Africa were genetically somewhat diverse, and some of that diversity got lost in specific regions, and (ii) some superficial features (like eyelid shape, many cranial features) are so easily variable that they can appear and disappear easily on a 10,000 year time scale. For example, you can't use skin or hair color to relate people, but you can use the underlying genetics, because the genotypes will generally be different. "The Ket language that was recently showed to be related to Na-Dene could be a product of this reverse migration to Siberia". "If you look at Y-DNA C haplogroup, which is found at high frequencies in Na-Dene, is also found at low frequencies in Inuits, North and Central American Indians". And South American Indians. In fact it's basically confined to northwest North America. Surely more indicative of a relatively recent movement INTO America, unrelated to the Inuit, rather than out of. "mtDNA A, B and X haplogroups (macrohaplogroup N) would then correspond to one of the morphological types found in the Americas, while C and D (macrohaplogroup M) would mirror the other morphological type". That could be so, to some extent. But evidently mtDNA A is not present in ancient South America. So it could belong to yet another movement into America. "Mongoloids surely didn't come out of nowhere, but we currently don't have any evidence of how Mongoloid (or rather proto-Mongoloid) morphology came into being. and also where"
To me the Mongoloid morphology suggests a period of selection in a region of high altitude and cold climate. The Mongolian eye-fold (different from the Khoi-San one), the relatively sparse body hair and their highly reflective skin. Perhaps from the region the phenotype is named after? "And South American Indians. In fact it's basically confined to northwest North America. Surely more indicative of a relatively recent movement INTO America, unrelated to the Inuit, rather than out of." Unlikely. It's geographically widely dispersed: Arctic (Inuits), Subarctic, Southeast, Central America, South America (I wasn't aware of South America, do you have a reference?) and is found among speakers of all three major Amerindian language divisions (Eskimo-Aleut, Na-Dene and the rest). It could've originated anywhere and then achieved high frequencies in Subarctic with the expansion of populations northward. Compare the high frequencies of mtDNA lineages in northern parts of North America and among Paleoasiatic peoples. Also, all genetic labs attributed Amerindian Q and C lineages to one migration. My interpretation is consistent with theirs, with the difference that this founding Amerindian population is much older than we think (on the strength of combined cross-disciplinary evidence). "That could be so, to some extent. But evidently mtDNA A is not present in ancient South America. So it could belong to yet another movement into America." You're right here. It hasn't been detected in ancient South America and in some modern areas of South America it looks like an intruder. It's frequencies are lower in South America than in North America. As far as ancient DNA goes, this may be a sampling problem. Notably, B, which is also part of N is frequent in South America and is attested in ancient remains. The best way to interpret these results is that prior to 12,000 YBP there was a large number of localized, fragmented, small demes throughout the Americas. At 12,000 populations began to grow, with some expanded north to Alaska and spilling over to Siberia, other south into South America. These expansions are responsible for the existing clines in the distribution of pan-American lineages. "The Mongolian eye-fold (different from the Khoi-San one)..."
How is it different? You must have picked it up from Cavalli-Sforza's writings. All epicanthuses fall into two types: internal and external and are simply measured on a scale, from very pronounced to minimal. Khoisans and Mongoloids have internal epicanthuses. "Unlikely. It's geographically widely dispersed: Arctic (Inuits), Subarctic, Southeast, Central America, South America (I wasn't aware of South America, do you have a reference?)" My reference is what I copied off a comment Ebizur made regarding Y-hap C3-M217(xC3c-M86) some time back. I hope he reads this and can provide his usual learned response. "and is found among speakers of all three major Amerindian language divisions (Eskimo-Aleut, Na-Dene and the rest)". That is hardly surprising. It's very unlikely that those groups remained genetically isolated from each other. "Also, all genetic labs attributed Amerindian Q and C lineages to one migration". But the current research questions that assumption. "As far as ancient DNA goes, this may be a sampling problem. Notably, B, which is also part of N is frequent in South America and is attested in ancient remains". But there's no need at all to assume that just because both haplogroups are N-derived they need have arrived in America together. In fact B is derived from R*, not directly from N*. Have a look at photographs. Mongolian eyefold is at the inside of the eye, Khoi-San at the outside. Presumably a different gene, or set of genes. Caucasoaustraliod is a generic term I use for ancient populations that are morphologically somewhere between Caucasoids and Autralo-Melanesians (Australoids). Zhoukoudian Upper Cave skulls are examples to Caucasoaustraliod morphology. Modern Ainu people are the result of admixture of the ancient indigenous Caucasoaustraloid population of Japan with the later arriving Mongoloids. also how would kennewick man fit into all this. Wasn't he white looking (at least he didn't look like one of just two populations). Kennewick man is also morphologically Caucasoaustraloid. He was at first assigned to the Caucasoid category, but closer examination revealed that he had a Caucasoaustraloid morphology like all other examined Paleoamerican skulls. "Have a look at photographs. Mongolian eyefold is at the inside of the eye, Khoi-San at the outside. Presumably a different gene, or set of genes." Scholars looked at both Mongoloids and Khoisans and they classified both eyefolds as "internal." See Weiner, Blood-group Investigation on Central Kalahari Bushmen // Nature 183 (1959). "But there's no need at all to assume that just because both haplogroups are N-derived they need have arrived in America together. In fact B is derived from R*, not directly from N*." Think logically, Terry, R is supposed to derive from N. This makes B likely the youngest to enter America. But it's found in ancient remains in South America (I believe in early Holocene) and is frequent in modern populations there. It's very infrequent in North America and absent in Siberia (although American Inuits have it at low frequncies). Haplogroup A is derived from N but it's missing from ancient remains in South America and is less frequent there. You claim that A represents a separate later migration to the new World corresponding to the "Mongoloid" migration to the new World (right?) but you base your inference on a data pattern that's the opposite from the data pattern associated with a phylogenetically younger haplogroup. My general feeling - and you know it - is that genetic phylogenies are flawed. But even if they were right, the emerging patterns are still very confusing. If there's any use to current phylogenies, the branching order should give us a clue as to the timing of colonization. But it doesn't. "Scholars looked at both Mongoloids and Khoisans and they classified both eyefolds as 'internal'". OK. So if we accept that to be so we have an interesting position. Wouldn't it be logical to assume that similar ecological conditions had led to the fixing of that phenotype? A semi-desert habitat with a great deal of glare seems accepted as explaining the Khoi-San eyefold. The same for Mongolian? Semi-desert? The Mongolian phenotype came to fixation on the edge of the Gobi Desert, and spread from there? "R is supposed to derive from N. This makes B likely the youngest to enter America". Doesn't necessarily follow at all. I think we can presume neither A nor B entered America as soon as they had formed. They could have hung around separately in East Asia for thousands of years. "It's very infrequent in North America and absent in Siberia"
But very common through most of China and out into the Pacific, as far as New Zealand. I'm sure it is the haplogroup most likely to have arrived in America via the coast, in boats. "You claim that A represents a separate later migration to the new World corresponding to the 'Mongoloid' migration to the new World (right?)". Correct. A is common in Northern China and Siberia. "the branching order should give us a clue as to the timing of colonization. But it doesn't". Why should it? As I pointed out above, the age of the haplogroup alone cannot tell us when it arrived in any particular region. Diversity within that region can give us some idea, but we usually have no idea how diverse it already was when it arrived there. "Caucasoaustraliod is a generic term I use for ancient populations that are morphologically somewhere between Caucasoids and Autralo-Melanesians (Australoids)". Which provides a connection from Europe in the west, across to Asia to Japan and then south to Australia. Not through India though. What does that do for the 'great southern migration theory'? During the Upper Palaeolithic anatomically modern humans (AMH) were morphologically quite different from the AMH of today in most of the world (including Europe). It is very hard to make inferences about modern races based on archaic races, which are far from being clearly defined yet. So molecular genetics is more reliable in finding genetic relationships between modern races. Btw, in one of my previous posts I twice misspelled the word Caucasoaustraloid as Caucasoaustraliod. Caucasoaustraloid is the correct spelling. Addendum to my previous post: Nutritional and environmental changes may also have contributed to the changes in morphology in the last thousands and ten-thousands years of AMH. So morphology may be more unreliable than we think in detecting the origins of a human group. So morphology may be more unreliable than we think in detecting the origins of a human group. Of course, the more recent is the time we are dealing with, the more reliable is morphology. "OK. So if we accept that to be so we have an interesting position. Terry: "Wouldn't it be logical to assume that similar ecological conditions had led to the fixing of that phenotype? A semi-desert habitat with a great deal of glare seems accepted as explaining the Khoi-San eyefold. The same for Mongolian? Semi-desert? The Mongolian phenotype came to fixation on the edge of the Gobi Desert, and spread from there?" I doubt it. If we look at all the data together, we see that Khoisans also have high incidence of the Mongolian spot in babies, their skin is lighter, their physical morphology is very different from that of other Sub-Saharan Africans, the Hofmeyer skull at 36K is also metrically Eurasians and not like modern Africans at all. Even linguistically their "clicks," albeit very distinct phonetically, show some similarity not to other African linguistic phenomena but to the phonetics of such secondary auxiliary registers as Paleosiberian and Ainu "throat-singing" and an Australian "secret language" called Damin. Neutral markers are so susceptible to genetic drift and gene flow that they may obscure ancient population relationships, while non-neutral biological traits and culture may preserve these connections better. See "Human Diversity and History" by Harpending and Eller (2000). I think Khoisans are an early offshoot of an East Asian or Northeast Asian population that went through a bottleneck and then expanded in Africa. "Doesn't necessarily follow at all. I think we can presume neither A nor B entered America as soon as they had formed....[B] But very common through most of China and out into the Pacific, as far as New Zealand. I'm sure it is the haplogroup most likely to have arrived in America via the coast, in boats." Terry: did they carry those boats all the way up to the Lake Titicaca? In some Andean populations, B is as fixed as in the Maoris. I don't believe in boats, overkills, volcanoes or hurricanes when they are inserted into human prehistory only to explain inconvenient facts. "They could have hung around separately in East Asia for thousands of years." Look, Terry, how many assumptions we need to make to make things work. Macrohaplogroup N expanded thousands of miles away from East Africa, where it supposedly originated; there are no intermediary lineages anywhere between East Africa and East Asia; then a couple of members of this haplogroup lingered somewhere for thousands of years before entering America in a single migration responsible for bringing to the New World a whole new phenotype (and these are neutral markers presumably), whose origin in Asia is unclear; the youngest member of the same macrohaplogroup sneaked into the New World via the coast in boats but penetrated the continent the deepest. This is an exercise of turning the map of the world into a chessboard and human populations into pawns. The only biogeographic pattern that's compelling to me is that mtDNA macrohaplogroup N (including R) and Y-DNA haplogroup C (which is as high in frequencies in the Maoris as mtDNA B) are very similar in distribution and probably originated as a result of one of the earliest splits in human population history. Since their representatives in Africa and in the areas adjacent to Africa are all derived if found at all, these macrohaplogroups originated way outside of Africa. Only in our wildest dreams do they constitute evidence of an "expansion" out of Africa. Terry: "Why should it? As I pointed out above, the age of the haplogroup alone cannot tell us when it arrived in any particular region. Diversity within that region can give us some idea, but we usually have no idea how diverse it already was when it arrived there." In the Pacific mtDNA haplogroup B is associated with the later Austronesian expansion and is not found among Papuans or Australian aborigines who contain various N lineages instead. We don't see the same pattern in the Americas. Back in the 1990s scholars tried to isolate haplogroup B as a late intruder into the Americas but after a while they abandoned these efforts in favor of a single migration. "Terry: did they carry those boats all the way up to the Lake Titicaca?" Excuse me? You don't actually have to physically carry the boats. It's quite possible to carry the design in your head. "Macrohaplogroup N expanded thousands of miles away from East Africa, where it supposedly originated"
I've always agreed that's a problem. Besides which it expanded widely, and almost certainly not from India (where the paradigm places it's origin). "This is an exercise of turning the map of the world into a chessboard and human populations into pawns". That's probably pretty much how it happens. Good analogy. "Since their representatives in Africa and in the areas adjacent to Africa are all derived if found at all, these macrohaplogroups originated way outside of Africa". I agree with that. However their deeper origin may still lie in Africa. "Back in the 1990s scholars tried to isolate haplogroup B as a late intruder into the Americas but after a while they abandoned these efforts in favor of a single migration". And this paper represents another change of mind. I strongly suspect the migration into (or out of) America was far from being a simple single migration. The claim here of two waves is probably a simplification. And polynesian haplogroup B is very diiferent from American haplogroup B. Basically they carry the same letter through an accident of history. "And this paper represents another change of mind." This paper comes from paleobiologists/physical anthropologists, not geneticists. There hasn't been any change of mind on the part of geneticists when it comes to the 4 main Amerindian haplogroups. It's one "migration." Same for Y-DNA Q and C.
"I agree with that. However their deeper origin may still lie in Africa." In the light of Green et al. 2010, its deeper origin may be with Neandertals (and/or other hominid species found outside of Africa). I wish Green et al. 2010 reported on the state of the EDAR gene in Neandertals which in humans and other animals is responsible for thick hair and in humans also possibly for the shovel-shaped incisors found at high-frequencies in Asians and Amerindians (including Paleoindians). "And this paper represents another change of mind. I strongly suspect the migration into (or out of) America was far from being a simple single migration. The claim here of two waves is probably a simplification." Per Edward Sapir, the magnitude of linguistic diversity in the Americas is compatible with just 2 scenarios: either extreme antiquity of a source Amerindian population or a constant inflow of populations from Siberia. "Excuse me? You don't actually have to physically carry the boats. It's quite possible to carry the design in your head." I was being facetious. But I don't believe there's any association between boats and haplogroup B. It's just too widespread, entrenched and found in different habitats to be derived from a single, accidental technology-driven migration. "And polynesian haplogroup B is very diiferent from American haplogroup B. Basically they carry the same letter through an accident of history." What's interesting is Amerindian and Polynesian versions of haplogroup B share the 9-bp deletion which is also found at high frequencies in... African Pygmies. It's supposedly part of L1 haplogroup there. "In the light of Green et al. 2010, its deeper origin may be with Neandertals"
Contrary to the view of most I'm quite prepared to accept a substantial non-African contribution to the modern human geneotype, not just Neanderthal. On the other hand I'm convinced that the surviving haplogroups all spread originally from Africa. But to me it's quite likely that the deeper origin of those haplogroups is outside Africa. That origin, at more than 100K, is surely too old to represent an ultimate origin in America though. "the magnitude of linguistic diversity in the Americas is compatible with just 2 scenarios: either extreme antiquity of a source Amerindian population or a constant inflow of populations from Siberia". My vote goes to the latter. The four mtDNA haplogroups may have each come in at separate times. "But I don't believe there's any association between boats and haplogroup B. It's just too widespread, entrenched and found in different habitats to be derived from a single, accidental technology-driven migration". I wouldn't be so sure. If the earlier inhabitants' boating technology was insufficient to effectively exploit riverside and lakeside environments any incoming population with the requisite technology could spread very widely very rapidly. "My vote goes to the latter. The four mtDNA haplogroups may have each come in at separate times." It's been 100 years since Sapir said it. Since then the former option has become more realistic. Geographically, it's hard to imagine a continuous inflow of populations into such a hard-to-reach region. Logically, if you believe America was colonized late but also with a large number of disconnected and temporally distinct migrations, then why didn't humans "discover" the passage much earlier, during their first wave of colonization of Eurasia. Genetically, such a massive migration of isolated demes would've resulted in much higher diversity levels in the Americas. Amerindian languages show striking similarities to language spoken in a wide range of geographic areas in the Old World (Australia, Papua New Guinea, Southeast Asia, Caucasus), but Siberia isn't one of them. Finally, even if Amerindian diversity can be explained through the hypothesis of a constant stream of migrant populations, this doesn't explain why Africa is so linguistically homogeneous. You would have to come up with another hypothetical scenario of, now, language extinction in Africa. In the end, the whole exercise will become purely ad hoc. "On the other hand I'm convinced that the surviving haplogroups all spread originally from Africa." Terry, you follow the logic only to a certain point, then you revert to myths. How come in Green et al. 's Neandertal study the San - supposedly the earliest offshoot of modern human populations - are closer to Eurasian populations than they are to the Yoruba. "That origin, at more than 100K, is surely too old to represent an ultimate origin in America though." They haven't been accepted because it's hard to determine whether the findings are tools or geofacts. (Again, they haven't been proven to be geofacts.) Now, in the light of cross-disciplinary evidence, they very well may be tools.